Did you know that you can make your own homemade crackers with just a couple of ingredients? And you can even make them green by adding spinach! 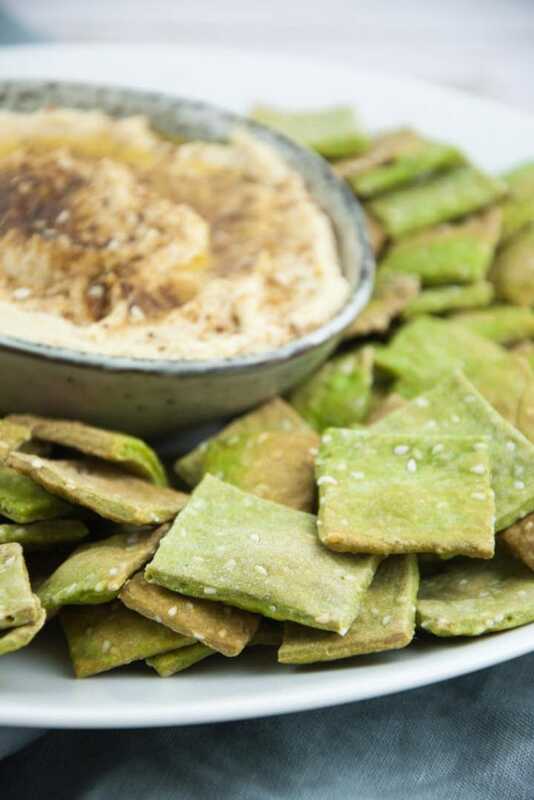 These vegan Spinach & Sesame Crackers are the perfect, vibrant and healthy snack! You know I love my cracker recipes! They are super easy to make, use basic ingredients, don’t take long, stay crispy for days, everyone loves them, and are perfect for dipping! So what’s not to love about them. 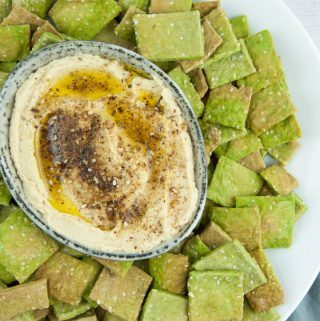 Together with hummus, they are my favorite thing to make for parties and potlucks! People are always impressed when I bring homemade crackers, but they don’t know how easy they are actually to make! 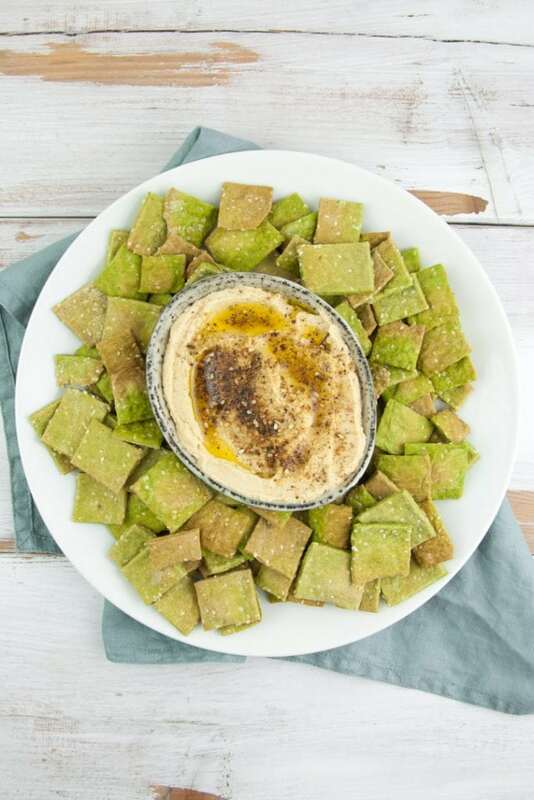 Oh, and I don’t think there would be a better snack for St. Patrick’s Day than these Spinach Crackers served with Spinach Hummus! Just saying. As always you can find the full recipe in the recipe box at the end of the post. Step 1: Combine the dry ingredients in a bowl. 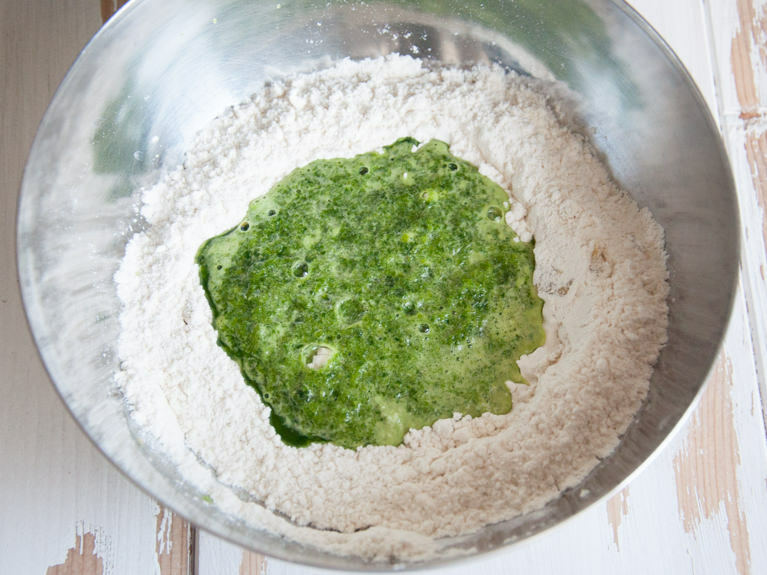 Then add the spinach-water-mixture (make this by blending spinach with water). Making these crackers is pretty similar to my other cracker recipes but instead of mixing the dry ingredients with water, we are using a mixture of spinach and water to make them green! Step 2: Stir to combine the mixture, then use your hands to knead a smooth dough. Step 3: On a lightly floured parchment paper, roll the dough out as thin as possible. Expert tip: This is the most important step. Really take your time rolling out the dough as thin and evenly as possible. Otherwise, your crackers will end up too hard or chewy and unevenly baked. Step 4: Using a pizza cutter to cut the crackers is the simplest and fastest method. Then pull the parchment paper with the crackers onto a baking tray. Bake them in the oven for 15-20 minutes until crispy! Step 5: Let them cool off. Then serve them with a dip! I’ve added a couple of ideas below. The consistency of the dough: Flour, water, even altitude matter when making the dough, so it’s best to trust your instincts a bit when making the dough. 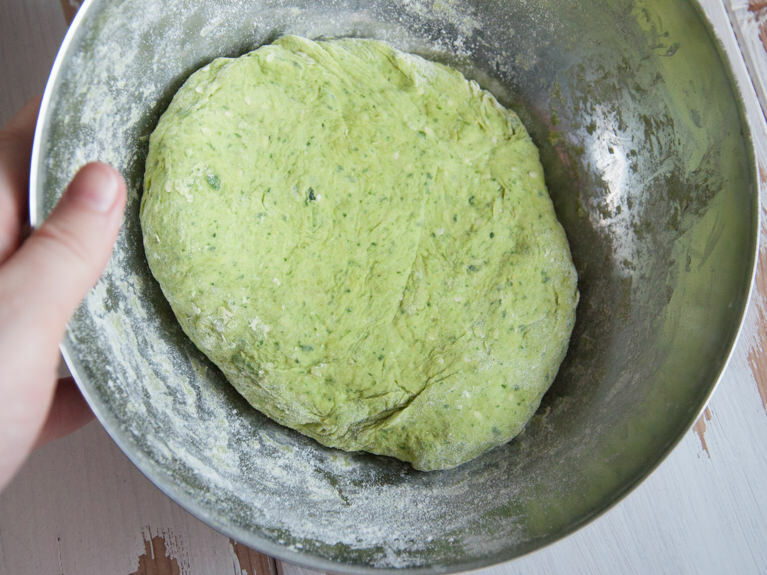 Add water until you can make a smooth dough. If you’re not sure, it’s best to make it too wet than too dry, you can always work more flour into the dough while rolling out the crackers. A wetter dough is easier to roll out than one that is hard and crumbly. The cracker thickness: Roll out the dough as thin and as even as possible. This ensures even baking! If they are not thin enough, they will be rather chewy than crispy. 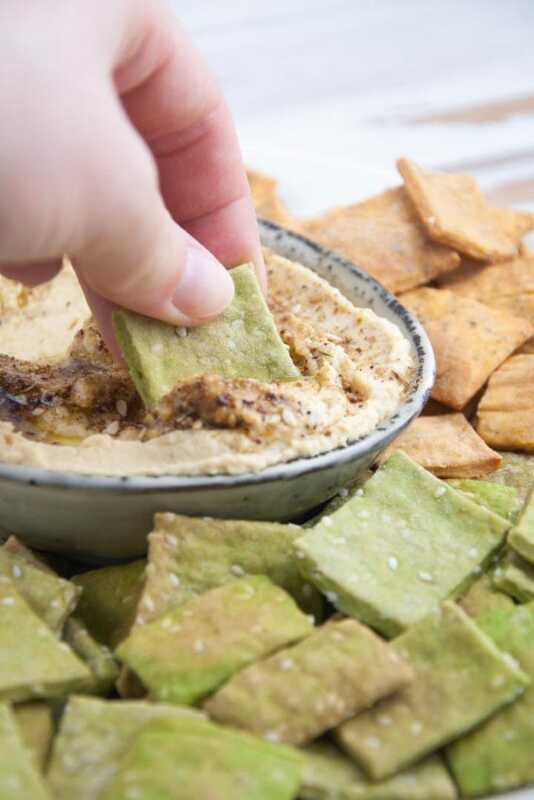 The best way to do this is to roll out the dough on a lightly floured parchment paper, cut them, and then carefully pull the parchment paper with the crackers onto the baking sheet. It also helps if you take your time rolling out the dough..sometimes it looks like it doesn’t get any thinner. Then I walk away for one minute and come back..then the dough has relaxed a bit and can be rolled out easier and thinner. Rolling pin: A proper rolling pin helps a lot with rolling the dough evenly. It works best with a large rolling pin with rotating handles. Baking times: All ovens are different. Keep a close eye on them if you make them the first time. If a few of them start to puff up a bit, that’s a good sign! They should get slightly golden/brown. If you’re not sure, they should be crispy to the touch. 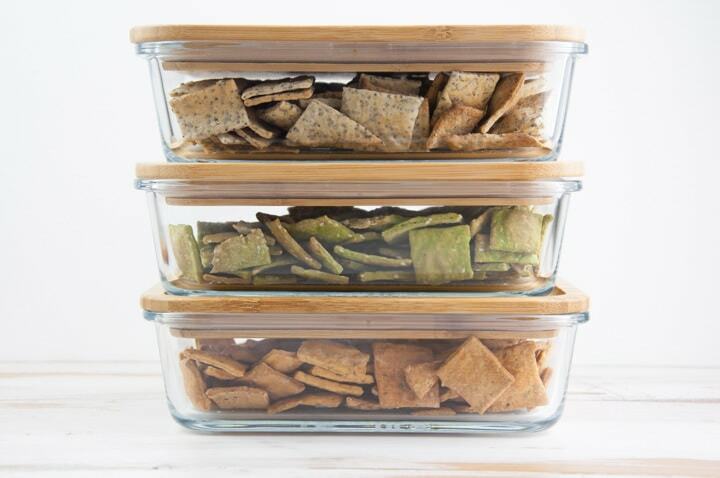 If you let the crackers cool off completely and then store them in air-tight containers, they will stay crispy for days! That way you can also prepare them in advance if you’re having a party coming up! I hope you will enjoy these crackers as much as I do! Let me know if you give them a try! And don’t forget to rate the recipe if you like it, this helps other users figure out if they are worth a try! 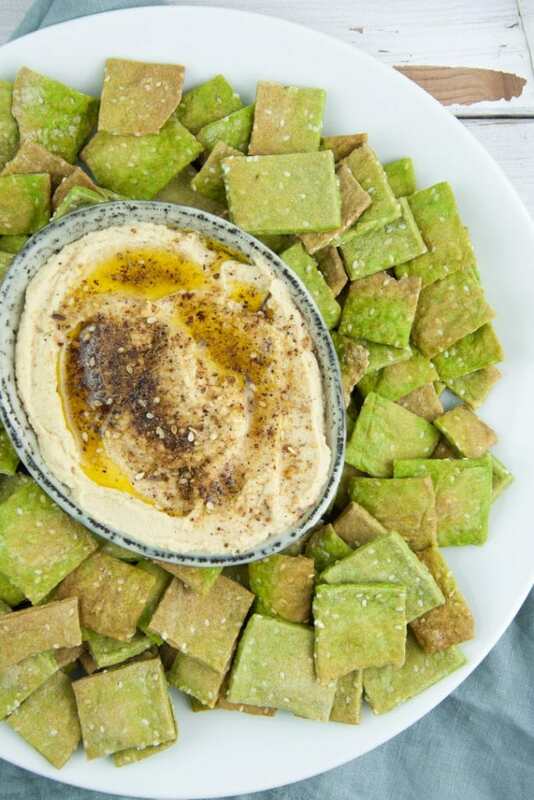 These vegan Spinach & Sesame Crackers have a lovely green color and are just the perfect snack for parties or just because they're healthy and delicious! In a mixing bowl, add the flour, baking powder, salt, and sesame seeds. Stir to combine, then add in the spinach-water and olive oil. Stir to combine again, then mix and knead with your hands (or use a kitchen machine with a dough hook) until it's a smooth dough. Add more flour if your dough is too sticky. On a lightly floured parchment paper, roll out the dough as thin and even as possible. Cut it with a pizza cutter length- and widthwise. Carefully pull the parchment paper with the crackers onto a baking sheet. Bake them in the oven for about 15-20 minutes (until they get crispy). Let them cool off and enjoy! *If your blender is having troubles getting the spinach into the blades, use double the amount of water and spinach and use only 1/2 cup of spinach water for the crackers. 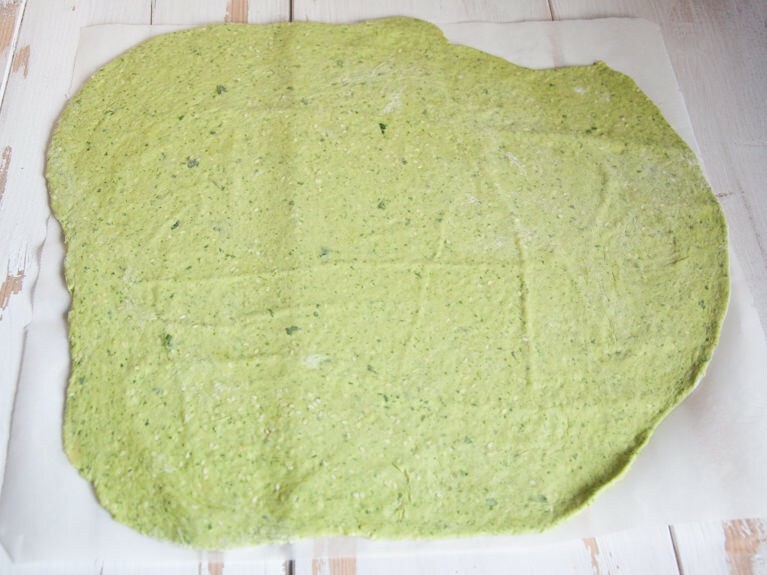 You can use the rest of the spinach water for a smoothie or of course, make another batch of spinach crackers. 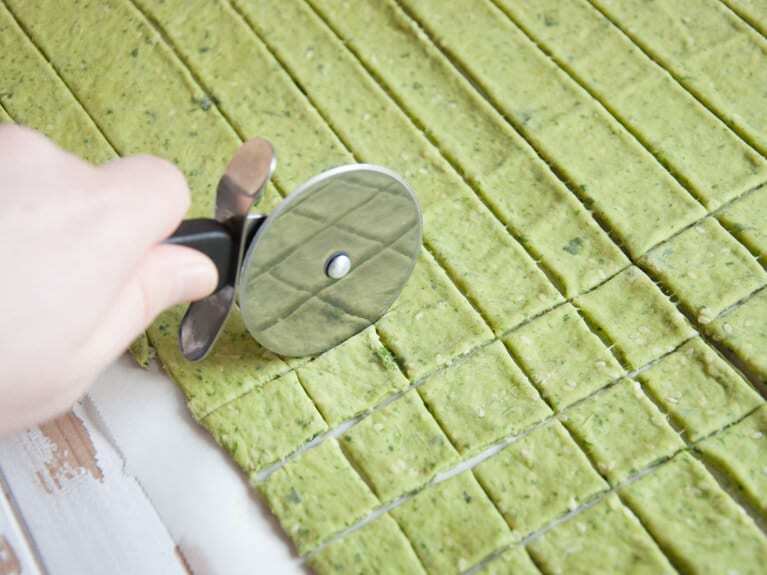 Expert tip: Rolling out the dough as thin as possible is the most important step. Really take your time rolling out the dough as thin and evenly as possible. Otherwise, your crackers will end up too hard or chewy and unevenly baked. The consistency of the dough: Flour, water, even altitude matter when making the dough, so it's best to trust your instincts a bit when making the dough. Add water until you can make a smooth dough. If you're not sure, it's best to make it too wet than too dry, you can always work more flour into the dough while rolling out the crackers. A wetter dough is easier to roll out than one that is hard and crumbly. Baking times: All ovens are different. Keep a close eye on them if you make them the first time. If a few of them start to puff up a bit, that's a good sign! They should get slightly golden/brown. If you're not sure, they should be crispy to the touch. These look fantastic Bianca! I’m sure you could use gluten free flour to make a gluten free cracker too. Holis has a great concept, I hope they’re successful and other grocers follow their lead. Pinned! You are just rocking the green recipes lately!! Fun and healthy and so good with hummus! I even thought about making a green hummus to go with these crackers but then decided it would be too much. Bianca, thanks! I DO love your ideas, so simply and delicious! I also love how versatile your pastry dough is. That said, now that I still haven’t tried my hands on it, I will probably just try two or three different versions when I finally get to it. My boyfriend never watches documentaries with me from the start because he thinks they are too boring :D but then most of the times ends up joining me somewhere in the middle. Not so boring at all! I’ve tried making my own puff pastry dough once but it was terrible – it wasn’t even edible (although I ate all of it, I don’t like throwing food away). I decided to stick to store-bought puff pastries from now on. Thank you so much for bringing that up, I didn’t know in which district it was. Greetings from sunny (yeah!) Linz! Me too! I made them again today and ate them with beet hummus – so good! These look so cute! <3 Love their green goodness. And I would totally enjoy some with beet hummus too — such a pretty color combo! Thank you so much, Audrey! I loved to color combo too!! It was my first time trying beet hummus and I was pleasantly surprised! I also love watching documentaries. I know the ones you’re speaking of, and they really wake and shake you up. I watch one (or at least a bit of one) every night after my family falls asleep. Most people don’t know how their food is produced or the affect it has on their health and the environment. I didn’t either until a few weeks ago. I’m not vegan (yet) but I hope to get there some day. Blogs like yours are so helpful! Yeah, I’m glad I’m not the only one really enjoying documentaries like that. My boyfriend would never, ever watch environmental documentaries with me when I’d ask him, but when I start watching without him he often joins me in the middle of the documentary. They’re so damn interesting! The last documentary I’ve watched was Cowspiracy which was really, really good & interesting too (it’s actually on netflix right now, if you haven’t seen it already). I’m so glad my blog is helpful to you! That makes me really happy :) Let me know if I can help you with going vegan – it was a gradually process for me too. I just cut out the milk, the cheese, the yoghurt step by step… and introduced vegan products into my diet. Would it be ok to eliminate the seeds? If so should I compensate with more of another ingredient? I am planning to do those again this week-end. Last time I used flax sees as I did not have sesame seeds. I am curious though,,, Last time, I ad to add a lot more water than just 1/4 of a cup. It was really dry and the dough was not sticking together. Do you think I did something wrong? Thank you!!! They are awesome. I had them in my lunch today. I ended u adding 1/4 cup of water. Do you know how long do these last for in an airtight container? Wow ,super ,fantastic….made these and they turned out exactly like yours. 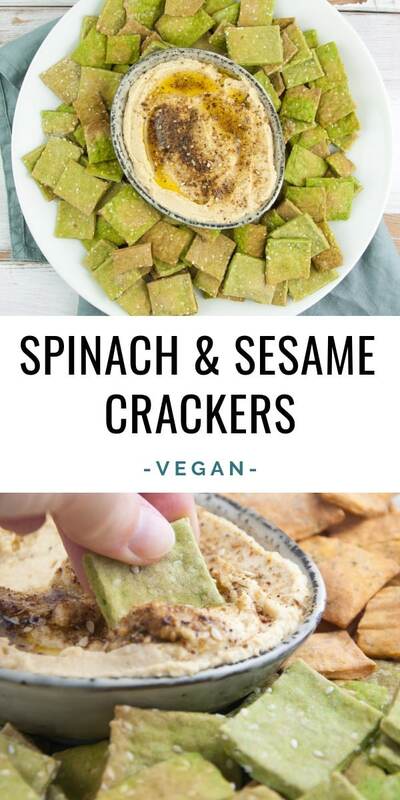 Had to find an idea to get my daughter to eat her spinach..and this is just a fab idea…she loves crackers and chips…so this was the best thing ever to come across on pinterest.I am going to try with other veges too…thanks so much..
Hey Saba, I’m so glad you and your daughter like them!! :) Trying out different veggies is a great idea! Have you seen the pizza crackers yet? I want to try these-they look good! Would whole wheat flour work? Any suggestions for rolling the dough evenly? I keep having problems wit uneven crackers and burnt edges. Also, I found it pretty strange to run into an add for Hillshire Farms Sausage in the middle of the recipe- what’s up with that? A proper rolling pin helps a lot with rolling the dough evenly. I actually have 3 different rolling pins :D so I should know..haha. It works best with a large rolling pin with rotating handles. It also helps if you take your time rolling out the dough..sometimes it looks like it doesn’t get any thinner. Then I walk away for one minute and come back..then the dough has relaxed a bit and can be rolled out easier and thinner. Sorry about the meat ad, that shouldn’t happen as I’ve blocked all meat and dairy ads but sometimes they sneak through.